There were some super first round matches on Tuesday’s Miami schedule but unfortunately there were no streams :-(. It’s disappointing, but there is now FULL coverage every day. Just a couple of years ago, Indian Wells and Miami weren’t televised until the first Sunday so it’s a big improvement. This post is skipping ahead (i’m busy tonight!) and covers two second round matches set for Thursday, Simona Halep v Daria Kasatkina and Elina Svitolina v Shuai Zhang. In case you missed it, we’ve already had a pair of guest posts from Jake who is at the Miami Open; you can read his thoughts on day 1 HERE and day 2 HERE. Daria Kasatkina continued her superb recent form to book a fascinating second rounder against the number five seed, Simona Halep. Kasatkina arrived in Miami after reaching the quarter-finals in Indian Wells with victories over Daniela Hantuchova, Anna-Lena Friedsam, Monica Puig and Timea Bacsinszky. By virtue of her best tournament so far (in terms of ranking points attained), Kasatkina shot up to a new career high of 36. Her rise up the ranking has been rapid as she only won her first WTA main draw match in July (!) last year. A seeding for Roland Garros, with very few points to defend up till then, is already in touching distance. Kasatkina won her first match in Miami, defeating Kateryna Bondarenko in a lopsided three set victory, 6-2 1-6 6-2 in one hour and 33 minutes. 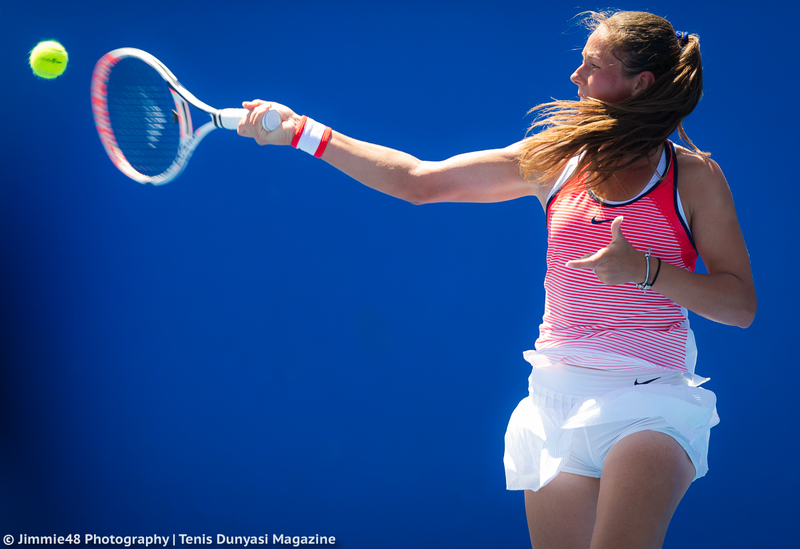 This was another good win for Kasatkina because Bondarenko has been in great form herself, reaching the fourth round of Indian Wells as a qualifier and racking up 14 wins this year (see detailed recap of the match HERE). The final set was much closer than the scoreline suggested with six of the eight games going to deuce and Kasatkina saving six out of seven break points that she faced. Halep enjoyed her best result of the year in Indian Wells, reaching the quarter-finals with wins over Vania King, Ekaterina Makarova and Barbora Strycova (via retirement). It was a much needed kick-start to the year for Halep who heads into Miami, where she reached the semi-finals last year, with renewed optimism. Part of a happy Team Dasha after her win today. Interesting stat: Kasatkina has more than the twice the amount of victories compared to Halep in 2016 with 13 to 6. Final thoughts: As you can imagine, i’m all over this match! Kasatkina has made tremendous strides already this year but this will be just her second ever match against a top five player. Halep will have to play a decent match to prevail but recent form in the desert would suggest she’s getting back to her best. It may be too soon to expect Kasatkina to start challenging or even winning these types of matches, but she’s currently in a nice zone; being new on the tour, the Russian is still somewhat of an unknown quantity to most players, and is also currently in the position where she is consistently gaining ranking points and not having to worry about defending yet. Intrigued to see how this one pans out but going for Halep in three. What a year it has been so far for Shuai Zhang… after smashing through at a Slam, winning her first main draw match in 15 attempts at the Australian Open and going all the way to the quarter-finals, the Chinese player has continued to impress since. 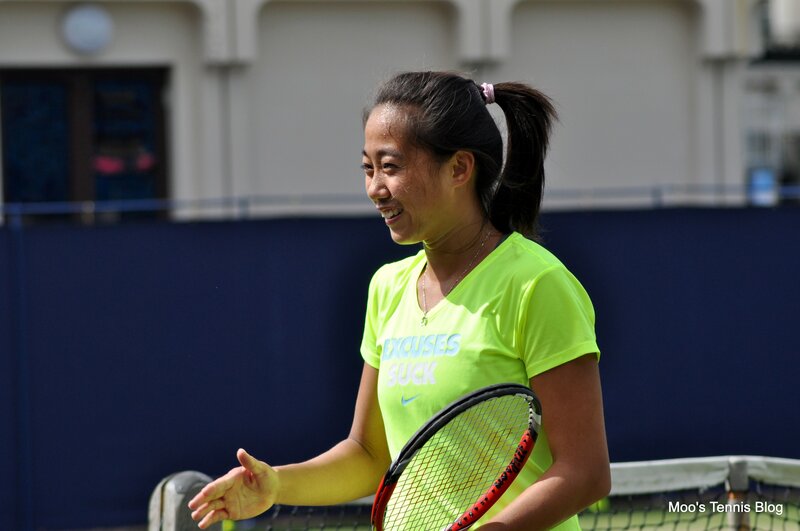 Zhang won an ITF tournament at Rancho Santa Fe in February and then reached the third round of Indian Wells, securing a big win over Caroline Wozniacki in the longest WTA match of the year so far. She lost in the third round to the eventual champion, Victoria Azarenka. Zhang won her first match in Miami against the 16-year-old, Sofya Zhuk, 6-1 6-2 in 59 minutes. Zhuk, the 2015 Wimbledon juniors champion, was playing her first ever WTA main draw match. Zhang saved all four break points that she faced and was solid off both the first serve (71% points won) and second serve (68% points won). Next up for Zhang is the number 12 seed, Elina Svitolina who has had a decent year so far. While she won just one match down under, Svitolina’s form has picked up since, winning three matches in Dubai and prevailing as champion in Kuala Lumpur for her fourth WTA title, beating Eugenie Bouchard in a thrilling three set final. All her titles have come at the International level but Svitolina is 4-0 in WTA finals. In Indian Wells, she scored a fabulous battling win against Annika Beck, coming from a set and a break down and within two points of losing the match to eventually storm through, 4-6 7-6(1) 6-1. Svitolina had nothing left in the tank for the third round where she was outclassed by a superb, Roberta Vinci. Final thoughts: Zhang’s fearlessness right now is taking her above and beyond so this is certainly worthy of an upset alert. Svitolina is a steady player, without many peaks in her level, but the conditions in Miami might suit her game. This could be a prime example of where Svitolina’s passive nature goes against her; however, i’d give the Ukrainian player the benefit of the doubt to battle through in a section of the draw that could open up favourably for the winner. March 23, 2016 in Halep, Kasatkina, Miami, Svitolina, WTA, Zhang. A shame Sofya didnt make it through. I think this girl has the look of a future $ star. Plus she trained at the Henin academy so that couldve been an interesting matchup against Svitolina. I think Halep should be fine here though. I think Daria is likely feeling all the tennis and big stage moments from the past few months. Her one real advantage is that I think the courts slightly favour her.